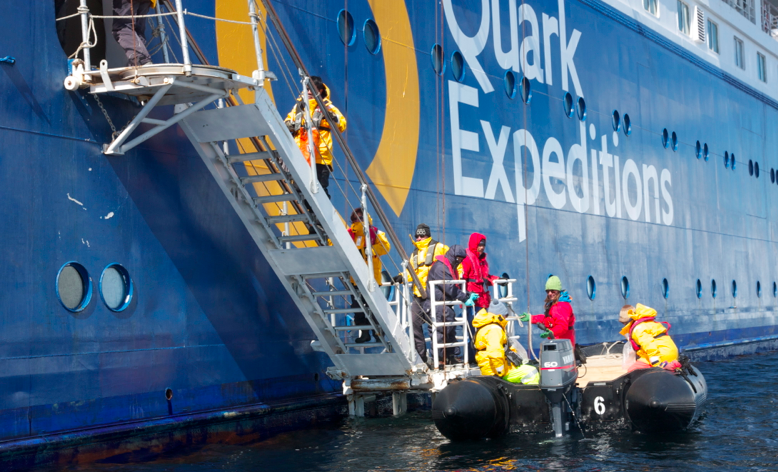 Zodiacs and Antarctic landings—a package deal | Where to next? 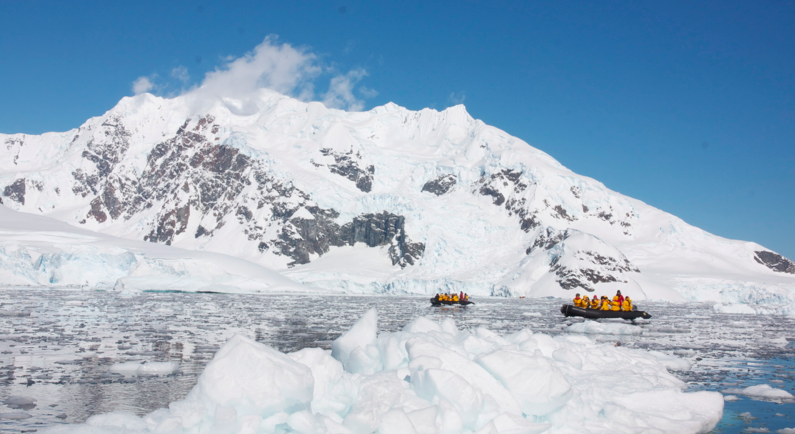 If you want to set foot on Antarctica, you first have to set foot on an inflatable boat. In our case it was a Zodiac. The Ocean Diamond had 18 Zodiacs that were used to ferry us ship-to-shore and back, and provide us with cruise adventures that got us closer to whales, seals, penguins, icebergs and more. Zodiacs are a cross between a boat and a catamaran, with an outboard motor and rigid floor. A Zodiac comfortably holds 10–12 passengers plus the driver, who stands in the centre at the back. I’m not sure how many cruises I had in our 10 days—probably about 30—and I enjoyed them all. But I gotta tell you that the coldest we ever were in Antarctica was when we were in a ‘speeding’ Zodiac. A lot of people have asked specific questions about the landings and Zodiacs, so here goes. Let me know if I missed anything, but keep in mind that I can speak only from my own experience (and I’ll write about cameras separately). How many landings did you have? We had three and a half days in the actual Antarctic, with a total of six landings—two on the continent itself. 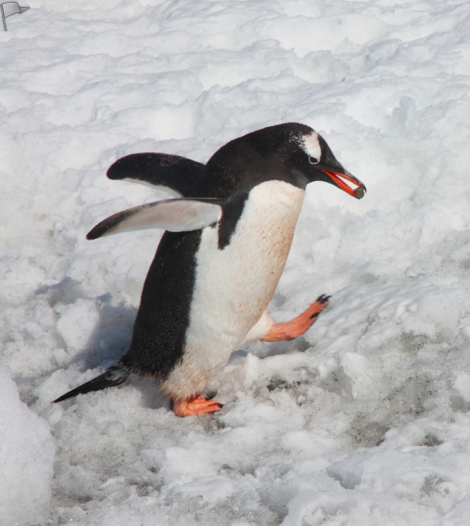 We were supposed to have eight landings, but nothing is certain in the Antarctic. We missed one landing because Port Lockroy was iced in. That stop was replaced by an extended Zodiac cruise. We missed out completely on the last landing because of an medical emergency mentioned elsewhere. Are there rules for landings? 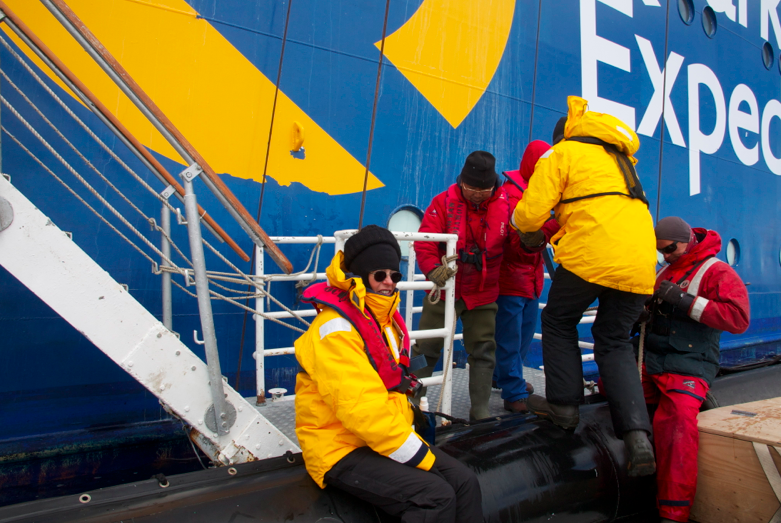 It doesn’t matter what ship or expedition you are on, there are lots of landing rules—and they’re consistent and all about common sense and protecting the environment. As we crossed the Drake Passage, we had a compulsory talk on environmental concerns in relation to the Antarctic and what we could and couldn’t do. If you didn’t attend, you couldn’t land. And yes, there was an attendance sheet. As for the rules, they’re not rocket science. Don’t take anything ashore except yourself, your camera, your warm clothes, your enthusiasm and a bottle of water. A tissue is okay, but don’t leave it behind. If you have to pee, you must go back to the ship. Like my mum used to say, ‘Go piddle before you get into your snowsuit’. But there’s more! Walk only on the marked paths and stay five metres away from the wildlife. That said, it’s okay if you stand somewhere and they come to you. A popular trick is to stand beside a penguin ‘highway’ when a penguin is at least five metres away and wait for them to come to you. Don’t be too noisy. Those of you who know me will not be surprised to hear that I was warned about this offense—but only once. 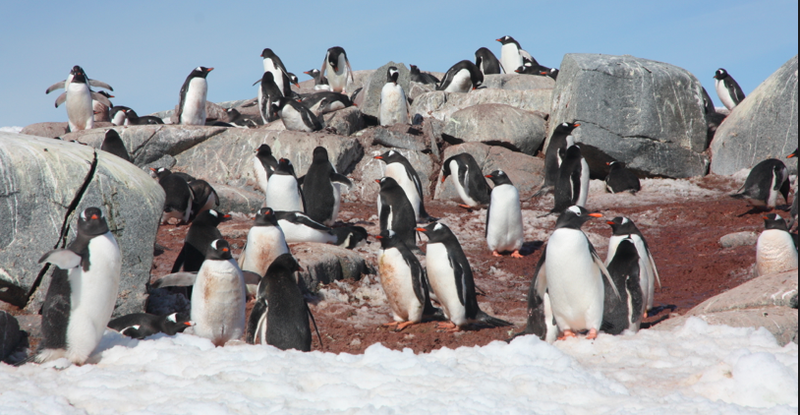 Many Antarctic sites limit landings to 100 people. How did they manage 182 people? Quite easily! As I mentioned earlier, the Ocean Diamond has 18 Zodiacs that can carry 10–12 people each plus a driver. So there was no problem carrying all 182 passengers (plus drivers) at any one time. But for all our landings, the group of 182 passengers was split into two. The first half would land and the second half would cruise. Then we’d change places. So here’s an example. Let’s say there’s a landing at 9am. If you want to land first, make sure you’re in the queue to board Zodiacs by about 8:45. I always wanted to do the landings first—just in case weather or other conditions changed—and never missed being in the first group. I never heard of anyone not being able to do landings/cruises in the order they preferred. There aren’t a lot of Zodiac rules, but a biggie is don’t stand up without asking the driver if it’s okay. There are a few passengers I could kick for not following this simple rule. We were also told what to do if the driver fell overboard! All our drivers were people we got to know because they also gave lectures or had other high-profile duties. They are ‘clipped’ to a kill-switch on the Zodiac, so if they fall overboard (it didn’t happen to us and probably is very rare) the engine cuts out. All drivers carry a sophisticated walkie-talkie, and they share information about wildlife sightings and safety. All other Zodiac rules relate courtesy and common sense. Don’t stand up in front of your fellow passengers and block their view or chance to take photos (better to turn and kneel). Stay quiet if wildlife is about. How hard is it to get in and out of a Zodiac? Breathe a sigh of relief. It’s not that hard. While we were still crossing the Drake Passage, we attended on compulsory talk on how to enter, exit and behave in a Zodiac (another attendance sheet). We were shown the ‘fireman’s grip’ or maybe it was called the ‘get in the Zodiac’ grip. It’s how the crew members who are there to help you to embark or disembark will grab your arm (gently but firmly) to guide you into or out of the Zodiac. The step up or down is about 12-15 inches, and you have two or three people hanging on to you—helping you. Seriously, if you can get up and down the single flight of stairs to where the Zodiacs are, you can get into the Zodiac. Trust me! Are Zodiacs safe in ice/rough water? 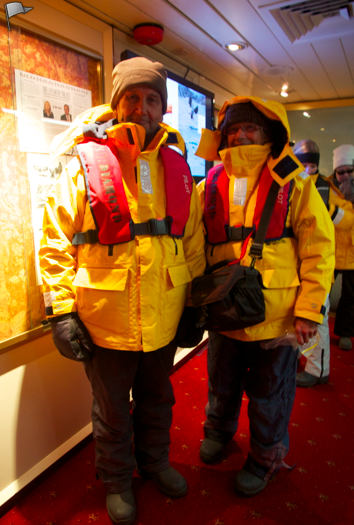 We had wonderfully calm waters for the entire time we were in Antarctica, so I have no experience with rough water. That said, Zodiacs were invented in the 1950s by French Navy officer and biologist, Alain Bombard. He sailed a Zodiac across the Atlantic Ocean in 1952 so I’m guessing rough waters don’t present too much of a problem. Jacques Cousteau loved Zodiacs and used them extensively on his expeditions. As for the ice, we spent one morning cruising through and over huge chunks of brash ice (wreckage from other forms of ice) because Port Lockroy was inaccessible. 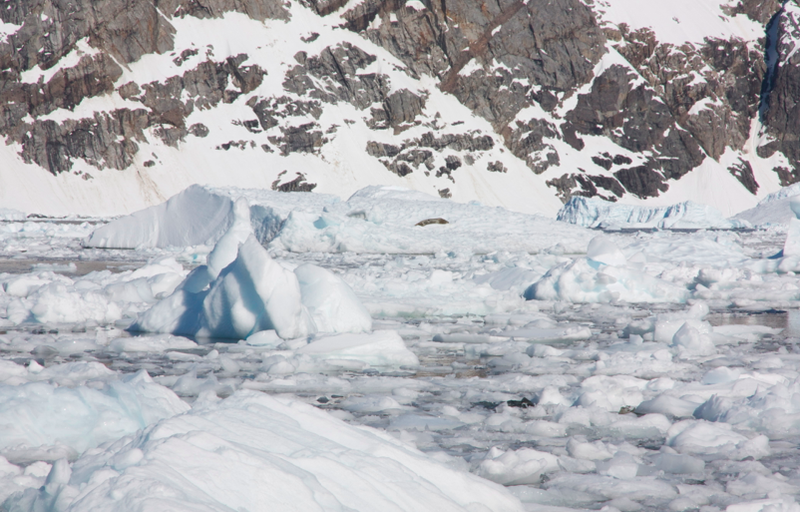 The ice was quite ‘dense’ and you could hear it crunching under the Zodiac as we passed through. One passenger asked if it was safe for us to be there. The driver (who resisted rolling his eyes) made it clear that he wouldn’t be doing it is he thought it was dangerous. I chose not to worry. My call is that the driver doesn’t want to die and the company wants to keep its good reputation. Nobody is going to do anything too stupid. I could write on and on, but will get this posted. Feel free to ask more questions. WOW! How exciting! Great piccies! WHY would ANYONE be SO stupid to try and stand up in one of those? Actually it is quite okay to stand up in a Zodiac, but only when the driver says it is safe to do so. Nice details…Were there options for camping/kayaking on the cruise and did you try any of those ? Hi Neel — Yes there were options to camp and kayak. Both were expensive with $200 to camp one night and $900 to kayak up to about eight times over four days. We didn’t do either, having camped all through Africa, South America, Europe, Asia and more, and not being experience kayakers. But everyone who took up these activities had a fantastic time. The weather was great for both too. Going on a similar tour in February on the Ocean Diamond. Just wondering how long were you out on landings? The cruise ship does that have heating? Did you need to provide your size to get your parka? Or they supply it once you board? So have a million questions going through my head! Very happy to answer your questions. We had two landings per day of about 90 minutes each. Then two Zodiac trips per day for the same amount of time. People could mix and match, so if you were really keen one way or the other, you could spend the whole time on land or in a Zodiac. The ship was very well heated and they seemed to have parkas of all sizes available. I took a larger one than I needed thinking I would have many layers underneath, but the parkas are so warm you don’t need all the extra room. They also supplied boots to wear ashore, but you hand them in at the end of the trip. The parka you could keep. It’s worth taking a pair of waterproof pants. Thank you so much for getting back to me! It has made me even more excited knowing we would be exploring more than I expected. We had a wonderful trip and excellent weather. Do drop back and let me know how yours goes. And feel free to ask more questions. I love feeling my world expand through your travels. Thank you for being so diligent with that camera! I don’t doubt it. 🙂 When I look over the list of places you’ve visited, I can’t help but wonder what you will feel when that list of places seen outgrows the places not seen. Antarctica—basics about our expedition and ship « Where to next?